In 2016, scholars celebrating the five-hundredth anniversary of Thomas More’s Utopia found themselves speaking to contemporary politics. More so, perhaps, than they had hoped. The year’s events, though more dystopian than utopian, are nevertheless likely to prove significant in the history of utopias. In Britain, the Brexit vote signalled the death of progressive European integration as a viable ‘utopia’ to structure the future of European politics. Just months later on the other side of the Atlantic, the election of Donald Trump marked the final collapse of the neoliberal consensus that underlay even the bitterest political battles of the past two and a half decades. Neoliberalism, too, is a kind of utopia—and the year’s events have demonstrated that its promise to end ideological struggle was ‘utopian’ in the worst sense of the word. Yet if the all-but-bereft utopias of a moment just passed have expired, what will replace them still remains to be seen. A few short days after the Brexit vote, I had the privilege to participate in a symposium at Clare College, Cambridge, on More’s text and its half-millennium-long legacy. Organized by Sasha Amaya and Naomi Woo—the Cambridge-based duo whose ongoing collaboration has included works of opera, dance, and physical theatre—the symposium was an unusual opportunity for multi-disciplinary dialogue. Participants included senior professors in history, English, and political science, alongside junior faculty and graduate students with a broad range of disciplinary allegiances. Following the symposium, a connected concert premiered new works by London-based French composer Louis d’Heudieres and Canadian artist Cam Scott, alongside a program of sixteenth-century choral music. Also attending the day’s events were three visual artists. In the months that followed, they have produced artworks in reaction to More’s Utopia and the themes discussed at Clare. Published here for the first time, their works cast new light on the symposium proceedings last June and, more broadly, on the possible relevance of the utopian tradition for art and politics today. At the time of the symposium, with the cloud of Brexit hanging heavily overhead, there was already a sense that our discussion could have contemporary political relevance. A number of the contributors spoke of ‘everyday’ utopias—literal or figurative spaces in which the performance of alternative norms and practices might hint at possible other realities. Even More’s text, which some contributors examined in historical and literary detail, seemed charged with a kind of contemporary radicalism. More’s ironic invective against gold and riches felt not so far removed from our own gilded age. Indeed, Amaya and Woo’s initial prompt for the symposium had been a quote from Fredrick Jameson’s Archaeologies of the Future, where Jameson asks if we might ‘invent a way of reading Thomas More’s Utopia (1516) so as to recover something of the shock and freshness of its elegant new Latin for the first European readers’. Inevitably, any discussion of utopia seems to return to Thomas More and his originary text. In Jameson’s words, Utopia serves as a ‘generic window’—the inevitable entry-point to the genre and a useful case study for making more universal observations. In our own explorations, More served as a starting point without limiting the eventual scope of our discussion. Within the space of our small symposium, papers ranged from detailing More’s life and letters to such disparate latter-day utopias as found in film, science fiction, and dance. Intellectual historian Gregory Claeys gave us one possible outline for tying these different threads together, in a masterful and sweeping history of utopianism from More’s day to the present. But we might also treat each the three artists’ reactions to the conference as a different conceptual apparatus for navigating the space between the specificity of More’s Utopia and the generic questions posed by the utopian tradition. Nicholas Johnson, a Hawaiian-born and London-based painter who trained at the Royal College of Art, has been creating complicated, semi-abstract paintings and collages of foliage and flowers for several years. His two acrylics here acknowledge More’s historical context in the age of discovery, mentioned in several of the morning session’s talks. The lettering on the paintings read, in More’s Utopian alphabet, ‘Vespucci’ and ‘Vespucci Paradisium’. It is a reference to Hythloday’s supposed connection to the famed explorer and by extension, to the situation of the island of Utopia in the New World, a veritable earthly paradise in the eyes of its first European explorers. Yet apart from the text, there is little that would ground these paintings as representations of a specific place or time. Paradise becomes abstracted as swirling splotches of saturated colours, as a fleeting expression of vegetative bounty. The closer we look, the more the specificity of Johnson’s representation melts into a generic pattern of shapes and colours, as placeless as the floral patterns of a William Morris wallpaper. Jonny Briggs, a London-based artist and photographer who also trained at the Royal College of Art, has taken up directly the question of More’s relation to the utopian tradition in his two composite ‘Protest’ drawings. 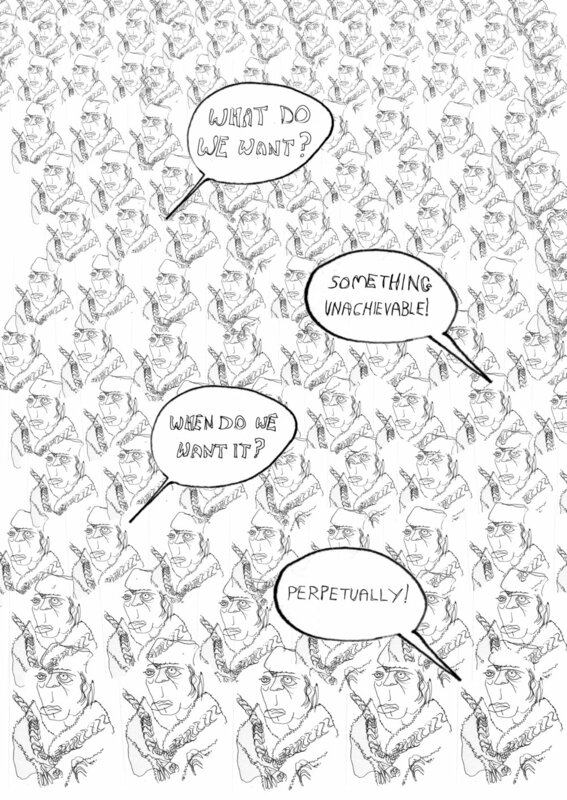 More’s likeness is digitally replicated across the page, as if More has become a meme for the utopian subject. Here, too, the image flickers between individual likeness and pattern; an unfocused gaze will lock not onto the faces but onto the web of dark marks made by the multiple Mores’ chains (‘all you have to lose is your…’—echoes of another, later, utopia?). The Mores’ chant highlights two of the consistent features that ran through the utopias Claeys touched upon in his history: their unachievability and their tendency to posit a post-historic, perpetual state of bliss. Yet the Mores’ chant of ‘perpetually’ speaks also to the historicity of the utopian tradition. The demand for the impossible has been made with incredible consistency across modern history. If Johnson and Briggs emphasize More’s usefulness as a ‘generic window’, Declan Jenkins’s Strength Beauty Agility traces unlikely similarities across disparate utopian projects. Jenkins, who studied at the RA, has made extensive use of the woodcut. His work often incorporates text, and he exploits the medium for its roughness and its simultaneously antiquated and ageless simplicity. Here, the fists bearing rings suggest the classical Olympics’ celebration of physical prowess, but also a Communist fist and the Soviet cult of the body, and perhaps also Tommie Smith and John Carlos’s black power salute at the 1968 Olympic games. It is striking, given this range of resonances, that the slogan, ‘strength beauty agility’, is in fact a direct reference to More’s description of the Utopians as cherishing ‘beauty, strength, agility as special and enjoyable gifts of nature’. Jenkins reminds us that the generic threads of the utopian tradition operate at the level of content as well as form, and that the utopian impulse might run deeper than the particularities of any one time or place. In all three cases, it is an asset to the artists that their representations are suggestive—almost inarticulate. The looseness of Johnson’s brushwork, the sketchiness of Briggs’s lines, the iconic anonymity of Jenkins’s prints all allow the artists to indicate a Utopia that is also utopia broadly construed. That lack of articulation also allows these artists—and art, more generally—to navigate the particular difficulties of representing utopia. For persuasively representing a utopian state of affairs seems a perennial challenge. As David Bell showed us, utopias seem littered with ‘killjoys’. Often the utopian morphs into the dystopian; the requisite closure of the ‘good’ place, as Edwin Van Meerkerk observed, provokes wild attempts at escape. And who has not heard the criticism levelled at Dante, that the poet’s portrayal of hell is more compelling than his attempts at portraying paradise? Perhaps these failures of representing utopia speak not to the impossibility of utopia but to the limitations of our capacity to imagine. In another essay, Jameson has suggested that imagining a utopia involves a ‘utopian leap’ across ‘the gap between our empirical present and the utopian arrangements of [an] imaginary future’. Our ability to think the utopian will always be compromised by our inability to imagine that which is truly outside our own ideological frame of reference, truly other to the experience of our un-utopian present. The roughly articulated but suggestive representation—more available to the artist than to the political philosopher—might give us an impression of that other world without filling in the details we are as yet unable to fathom. This is what so appeals in Johnson’s brushwork. In his Vespucci Paradisium, the succulent fruits, which are almost entirely indicated by the absence of the dark colours that swirl around them, seem as if they could not be more present. Chiaroscuro would have given us the most perfect fruits we can picture in this world; Johnson’s fruits give us a glimpse of that which even our imaginations struggle to render. The incomplete gesture opens a space of possibility for the as-yet-impossible-to-imagine. Bridging the ‘utopian leap’ might also be accomplished through various modes of mediation. In More’s text, the elaborate framing in Book I, especially the displacement of the description of Utopia into Hythloday’s voice, encourages the reader to consider abstractly the merits and demerits of the Utopian system. More himself has lingering questions and ‘can hardly agree with everything he [Hythloday] said’ at the book’s end. Utopia can remain, as Sarah Lohmann suggested to us, a provocative exercise in ethical reasoning, rather than a firm description of a path forward. Indeed, this distancing and mediation is cleverly evoked in Louis d’Heudieres’s new composition, various interpretations of utopian music, premiered at the symposium’s evening performance. By relaying in spoken language their experience of several excerpts from Mahler’s Second Symphony, the performers offered the audience a mediated and fleeting experience of a work of art to which only the performers (who wore headphones) had sensory access. The resulting cacophony of linguistic description in turn became its own soundscape—a translation that maintained an intimate connection, but no auditory resemblance, to Mahler’s original. Mediation and translation appear similarly as themes in Jonny Briggs’s portraits of the characters from Utopia Book I. Several of the pieces, copied from famous portraits, were executed as blind contour drawings, with the artist looking at an image of a historical portrait but not at his pen and paper as he drew. The tenuous relationship between the artist’s eye and hand is inserted as a gulf between an original image and the literally sketchy copy offered to the viewer. For both d’Heudieres and Briggs, the artwork involves a performance of mediation that echoes the analogous act of translating across the gulf of time, space, and experience that separates utopia from reality. Both works demand of us an active imagination. But they also demand a suspension of our frustration with the imperfect copy and an appreciation for the particular merits of a mediated image of an inaccessible reality. In a different mode, Jenkins’s cryptic print Dig for Utopia also serves to provoke politically significant acts of imagination. Its simple, straightforward slogan and its stark two-colour design are reminiscent of propaganda posters of the 1930s. Yet the familiar sense of the iconographic is undercut first by the intentional crudeness of the carving, and second by the absurdity of icon and slogan. The image conjures a momentary sense of inevitability—of course one would dig for utopia!—before collapsing into incomprehensibility. Suddenly, it demands comparison to our own slogans and political assumptions, the strangeness of which have now become visible. Meanwhile, the image of the four-headed shovel invites a range of possible associations. Digging brings us back to escape, for one might dig to tunnel out from someplace, but it could also be one more gesture to the perpetual unachievability of utopia: digging endless trenches that place one only deeper in the muck. The implement itself might be a figure for the crudeness of our own tools. Or for the difficult coordination that any kind of political progress requires: one must time one’s shovel-strokes with the bloke holding the other side of the digging tool. Still, the eyes are watching us. What would it mean, in our world, to take up the shovel? In the space of the absurd that Jenkins has invited us into, questions about our own present, ordinarily difficult to voice, become possible to pose. The image, though cryptic, is not necessarily ironic. It ushers the viewer into a discursive space of possibility in which both realism and irony can, for the moment at least, melt away. Are these not the preconditions for creative political thought? To be fair, the political Right’s pursuit of nationalist dystopia seems to rest on a wholesale abandonment of realism and irony both, a total freedom from facts and self-knowledge. But it is an elixir that in milder doses might encourage the political creativity we so desperately need. What this kind of art offers us is the opportunity to experimentally occupy a utopian state of mind, in which the assumptions that constitute the ideological closure of our politics might momentarily slip away. There, perhaps, images of a better state of society, which we cannot yet articulate in greater detail than broad brushstrokes, seem to flicker as real possibilities. Immediate in the moment of the viewer’s enrapture, such inklings are what—to echo the words of another of Jenkins’s prints—allow the ‘joy of failure’ to coexist with the ‘failure of joy’. Such inklings are what allow us to begin to translate our desires into the form of a future still invisible beyond the horizon. Gallery of visual artworks produced in response to the event. Reproduced here with kind permission of Declan Jenkins, Jonny Briggs, and Nicholas Johnson.